The BBC is taking measures against the unauthorized use of its iPlayer service by actively blocking UK VPN services. The measures aim to prevent foreigners from accessing iPlayer without permission, but they're also blocking many legitimate UK citizens from surfing the Internet securely. The BBC’s online catchup service iPlayer has been a great success, both in the UK and abroad. While the service is intended for UK viewers, who have to pay a mandatory TV license, it’s also commonly used overseas. Recent research suggests that 60 million people outside the UK access iPlayer through VPNs and other circumvention tools. However, over the past several days TF has received several reports from VPN users who can no longer access iPlayer from UK-based VPN servers. 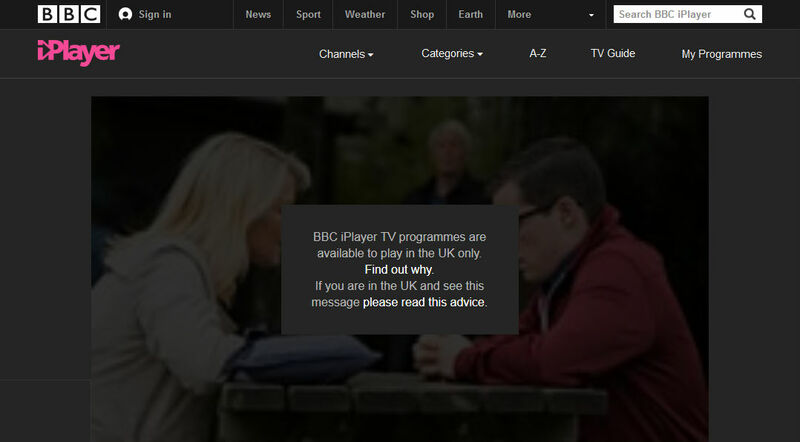 “BBC iPlayer TV programmes are available to play in the UK only,” is the notice they receive instead. This effectively stops foreigners and expats from accessing the service, but it also affects license paying UK citizens who use a VPN to browse the Internet securely. They will now have to disconnect their VPN if they want to access iPlayer. The BBC informs TF that the VPN ban was implemented to keep iPlayer ‘pirates’ at bay. The company is doing its best to keep company and school VPNs open but advises regular users to disconnect their VPN service in advance if they want to access iPlayer. The BBC admits that this may affect privacy conscious UK license payers as well, but says it doesn’t have the ability to discriminate between legal and unauthorized VPN users. Several VPN users are not happy with the change and have voiced their complaints. The issue is also causing concern among VPN service providers, which are looking for options to circumvent the blockade. IPVanish informs us that it has applied a ‘fix’ which has solved the problem for now. Similarly, TorGuard offers customers a new UK IP-address upon request, which helps, at least temporarily. “Let the game of whack-an-IP begin,” TorGuard’s Ben van der Pelt tells TF. TorGuard is hugely disappointed with BBC’s broad blockade, and the fact that the broadcaster is willingly throwing many legitimate consumers under the bus. “It amazes me that an increasing number of streaming services are willing to sacrifice hundreds of thousands of legitimate members over VPN usage. One can only assume this will hurt BBC iPlayer subscriber numbers as most people will simply look elsewhere,” Van der Pelt says. In part the VPN blockade is being implemented to appease foreign broadcasters who buy programming from the BBC. If this content is easily available online foreign TV companies may lose part of their audience. Earlier this year the BBC shut down its international version of iPlayer. This allowed people from oversees to access it for a small fee, but also caused concern among local rightsholders. Update: In a follow-up a BBC spokesperson informed us that the 60 million figure mentioned in the BBC article is not realistic. Update: BBC is also responding to customer complaints with the following email.